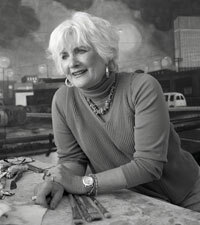 Bonnie Dolin graduated from the Cleveland Institute of Art in 1973 with a BFA in Painting and Printmaking; and in 1985 she went on to receive her MFA from Kent State University. For the last several years the city has been her subject matter of choice, and though she isn”t particularly interested in specific places, she is drawn to the general industrial areas and neighborhoods. Her attraction stems from time she spent in Cape Cod photographing the houses – and for a time a great deal of her work focused on the houses. When she returned to Cleveland and to her studio, she often photographed the view from her window which overlooked an old commercial and residential area, which ended at the shores of Lake Erie. The homes reminded her of a cape house which she grew to admire. The shifting light, color, and weather of these places are her inspiration. In November 2004 she was sent by the United States State Department to conduct programs in Chisinau, Moldova.